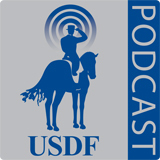 For our first USDF episode of 2019 we will talk to Eliza Sydnor Romm about the dressage foundation and all of their wonderful grants, after that we will be joined by Bill Warren and Bill Mcmullin to go over the new USDF tests. Our training tip focuses on simple exercises to improve canter balance. This week we start our new series "Meet the Authors." FEI 4* Dressage Judge Christoph Hess joins us to talk about his new book Ride Better and the accompanying DVD Fine Riding. In our education series, we have part 2 of Prohibited Substances in Feed and Supplements. Christoph Hess, Germany, is an FEI 4* Judge in both Dressage and Eventing. The German National Federation (GNF) awarded him the title of Professional Riding Instructor, a title that labels him as an international expert and educator of professionals. Hess is actively involved in the education of judges and instructors both within Germany and around the world. Eileen Phethean is Kentucky Equine Research’s Chief Operating Officer. Eileen received her B.S. in Animal Science and her MBA from the University of Kentucky. Eileen has also enjoyed a lifelong association with horses. This week USEF Large R Technical Delegate and Co-chair of the US Equestrian Dressage Sport Committee Lisa Gorretta joins us to talk about the newest USEF rule changes and FEI 4* Judge Charlotte Bredahl-Baker shares her tips on preparing for show season. Lisa Gorretta, Chagrin Falls, OH, serves as the USDF Vice President, USEF ‘R’ Technical Delegate, FEI Level 2 Steward and Co-Chair of the US Equestrian Dressage Sport Committee. Charlotte Bredahl-Baker, Solvang, CA, was a member of the 1992 Olympic Dressage team, she is an FEI 4* Dressage Judge, USEF Assistant Youth Coach and USDF Honorary Instructor. This week FEI 5* Judge Janet Foy joins us to share her tips on getting the most points as possible in your dressage tests and we have some excerpts from previous interviews with Beth Baumert, Michael Bragdell, Stephen Clark, and Scott Hassler. Janet Foy, Wellington, FL, is an FEI 5* Dressage and Young Horse judge, a USEF S Dressage judge, and a USEF R Sport Horse Breeding judge. She is a USDF L Education Program faculty member; a USEF Dressage Committee member; and a member of the USDF Judges and L Program Committees. She is the author of Dressage for the Not-So-Perfect Horse and Dressage Questions and Answers. This week we are joined by two USEF Senior Judges; Dolly Hannon joins us to talk about what to do when things go wrong in a freestyle test and Marilyn Heath discusses Judge responsibilities. In our education segment, we have part three of our series on the mind/body connection with Sandy Venneman. Janet ‘Dolly’ Hannon, Arvada, CO, is a USEF Senior (‘S’) Judge, USDF Certified Instructor through Fourth Level and Chair of the USDF Freestyle Committee. Dolly has also earned her USDF Bronze, Silver and Gold Medals. Marilyn Heath, Naples, FL, is a USEF Senior Dressage Judge, L Education Program Faculty member, USDF L Program and Judges Committee member, and USDF Lifetime Achievement award recipient. Sandy Venneman PhD, Sealy, TX, is an experimental psychologist, with a lifetime teaching certificate in secondary education. Sandy combines psychology with 40 years experience riding to help equestrians reach their potential. Coaching riders in the use of psychology to improve their riding, she instructs and gives mounted and un-mounted clinics nationwide.